On September 1, 2013 spectators in the infield of the New Hampshire Motor Speedway may have noticed a peculiar occurrence involving car No. 8 as it sped past the pit area along the eastern straightaway: a petite, wrinkled left hand performing a parade wave out of the driver’s side window. Frances Anderson, who lives in Belmont and turns 88 years old today, seemed less enthralled with accelerating than with checking off one of the last items on an extensive bucket list, which has included trips to 45 states and more than 20 countries. There was the rafting vacation in Canada, the twin-engine flight over Alaskan glaciers, the Blarney Stone she kissed in Ireland, and the hilltop fortress she hiked to in Israel. “This is just another thing,” she said yesterday, shrugging. Anderson has 11 grandchildren, and two on the way. 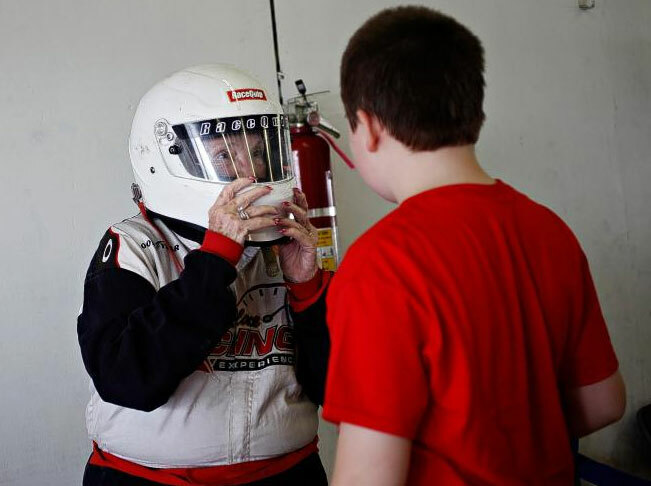 The plan, conceived by Anderson and organized with help from her five children, was this: eight laps around the track alone in a professional stock car, ideally topping out around 88 miles per hour, to commemorate her impending special occasion. Anderson, who has two artificial hips and a pacemaker, had arrived at the infield about 11 a.m., and was still waiting for a vehicle by quarter to one. She wore a jumpsuit and sat in a folding chair in the pit area, an entourage of a dozen family members and close friends standing around her. “I’m a little nervous,” she admitted. An employee had mentioned earlier two minor crashes that had occurred on the track in the morning. Jon Haney, a driving instructor who had coached Anderson – when to accelerate, when to brake, how to maneuver on the track – said he wasn’t too worried. “I’m more concerned with these young guys who play X-Box and come out thinking they know what they’re doing,” he said. Haney said Anderson was the oldest woman to race the track. Just before 1 p.m., her car arrived at the pit stop. It was red and blue and had the name “Budweiser” emblazoned on the side. A young man with cut-off sleeves and a Chevy emblem tattooed on his arm helped Anderson into the vehicle. He fastened several straps across her body, and she glanced over at her support group. “You know where my papers are,” she said, joking. The ride itself was perhaps less exciting than her family had expected. 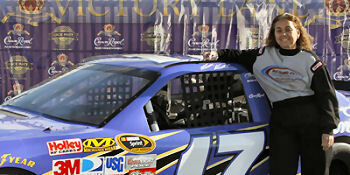 “I think she’s actually slowing down,” her son Fred Anderson said as she passed the pit area for the fourth or so time. A handful of other cars on the high side of the track whizzed past her. Afterward, when Anderson emerged from her car, a crowd of mostly strangers waiting to drive themselves or witness others do so gave her an ovation. She hoisted a detachable steering wheel into the air and beamed. Then she found her old folding chair and unzipped the top of her jumpsuit. Her cheeks were flush and someone handed her a bottled water. “I didn’t chicken out, did I?” she said, looking at a few friends. “No, you didn’t,” they replied. December 3, 2011 – NASCAR Race Mom (Oma) participated in the Richard Petty Driving Experience (RPE) at the Las Vegas Motor Speedway. To report that NASCAR Race Mom was anxious would be an understatement. I was downright scared. However, I was the oldest of the group and wanted to represent my generation well! I was determined not to chicken out as well. The Richard Petty Staff informed us that our No. 17 Matt Kenseth Crown Royal racecars were capable of driving about 170 miles per hour. However, we would be limited to the 130-135 range. I remained petrified while I struggled through the window to get into the racecar; then a strange kind of calm settled over me. Lap after lap, the Richard Petty Experience became more and more fun and exciting. Before I knew it we were pulling into the pits. I was not the fastest on the track, but to my surprise, NASCAR Race Mom was not the slowest either! The experience really supplied me with an altered and more cognizant perspective as to what a real racer faces in each race. I cannot imagine the difficulty of doing what I did with forty-two other drivers trying to pass you. Oma would recommend the Richard Petty Driving experience to all NASCAR fans! It was the funniest off-season activity I had and I would love to tackle the challenge again. I bet I could go even faster! Social Media Updatesfrom the K&N Pro Series West!